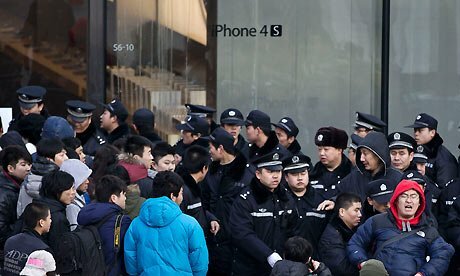 Apple has decided to halt the sale of all iPhone models from its stores in China, after large crowds disrupted the launch of the iPhone 4S. An Apple store, in the Sanlitun area of Beijing, did not open on Friday after a large crowd gathered outside in anticipation of the launch. China is the world’s largest mobile phone market, and Apple’s second-biggest market. The iPhone 4S, which has voice-activated functions, was being introduced through official Apple stores in China for the first time. Apple said in a statement that it decided not to open its store at Sanlitun “due to the large crowd, and to ensure the safety of our customers and employees”. The company also said that it was halting the sale of iPhones at all retail stores in Beijing and Shanghai “for the time being”. However, Apple said Chinese customers can still purchase the phones either through the Apple online store or at China Unicom and other authorized sellers. The decision came despite the fact that other stores in Beijing and Shanghai opened without incident and reported rapid sales. Apple said all iPhone 4Ss were now sold out in stores in China. Crowds began gathering outside of Apple stores overnight and in the early morning. Police were deployed to a number of stores to help control the crowds. Eggs were thrown at Apple’s Sanlitun store in Beijing after it failed to open on Friday at 07:00 local time as advertised. When it was announced that the store would not be opening, there were shouts of “open the door” and “liar”. Customers at the Sanlitun store said they were disappointed not to be walking away with any purchases. “I’ve been waiting here since yesterday afternoon, then this morning they say they won’t sell,” a man in his 20s told Reuters TV. By about 10:00 local time in Beijing, the crowds had cleared the area in front of Apple store.